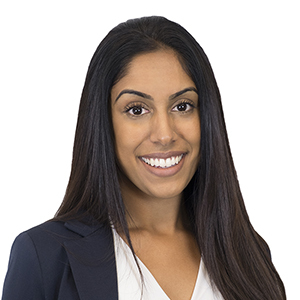 Aliana is an articling student in Gowling WLG’s Toronto office. Aliana completed her JD at Osgoode Hall Law School. During her time there, she was part of Pro Bono Students Canada and spent time working with the Health Professionals Review and Appeal Board. She was also elected as a 2L Representative of Osgoode’s Business Law Society. Prior to law school, Aliana completed an honours Bachelor of Business Administration (BBA Hons.) from Wilfrid Laurier University with a specialization in international business. She then gained professional experience as a financial analyst at various organizations including Blackberry, Estée Lauder, and LCBO. Over the summer, Aliana assisted in the publication of a report on pre-trial detention for the Foundation for Human Rights Initiative in Kampala, Uganda. She returned to Kampala during her 2L as part of an international law intensive program at Osgoode. Aliana will focus her articling term with an intensive rotation in the Gowling WLG Business Law Department. 18 September 2018 Federal Court restricts Canada Revenue Agency fishing expeditions for "Unnamed Persons"